ATV Mud Tires - Reviews, Tests, and Specifications. ATV mud tires have turned into a hot topic lately. It's no wonder with all the muddy 4 wheelers you see everywhere! 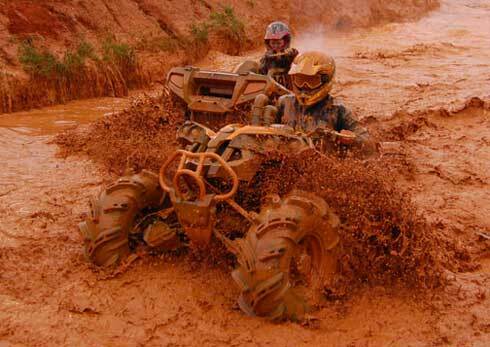 Mud ATV riding seems to be the fastest growing segment of the sport. That's why we did a ton of research so we could help you get down and dirty. There may not be a "Best" mud tire but we'll try to help you find the best one for you. A lot of mud ATV tires are coming out now so we'll do our best to keep up. If you know of one we haven't covered - tell us about it. This section well be updated often so be sure and check back so you won't miss anything! Find out which ATV tires work the best for mud riding. ATV Outlaw Tire - Best Mud Tire? - The High Lifter ATV Outlaw tire represents the state of the art among mud ATV tires right now. Before the Outlaw ATV tires came out - your typical ATV mud tire was heavy, rough riding, fast wearing, and didn't hook up in deep ruts very well. Since the High Lifter guys play in the mud full time they decided they could come up with a better tire for the serious ATV mud rider. They had several goals to achieve. GBC Gator ATV Tires - A less radical design than other mud tires, the Gator has proved to be one of the most popular mud tires because of it's versatility. High Lifter Outlaw ATV Tires - The High Lifter Outlaw ATV tires have become the weapon of choice for a lot of you ATV mud riders out there. We'll run through some of the unique features of this mud tire first. Then we'll tell you where to find the best deals around. Interco Black Mamba Four Wheeler Tires - Check out our exclusive review of the latest entry into the ATV Mud Tire Wars. The Black Mamba tires have one of the most aggressive tread patterns we have seen. Find out if they really work, or just look the part. ITP Mud Lite ATV Tires - ITP Mud Lites come in two flavors - old school bias and the newer XTR radial. The fact that both are called Mud Lites is really misleading since they don't have very much in common. The tread patterns are significantly different and the XTR is only available in limited sizes. See our in depth review and recommendations on both models. Kenda Bear Claw Tire for ATVs - Reviews of the Kenda Bear Claw four wheeler Tire and tips on finding the best deals. If you're looking for an all around trail tire that can get you through most mud holes - this Bear Claw tire is hard to beat. Maxxis Mud Bug ATV Mud Tires - We checked with our usual group of suspects form around the "internets". Then our sources for owner surveys. Throw in a few phone interviews with dealers and we have a pretty complete picture of how the Maxxis Mud Bug ATV tires work. Be sure to see what we found out. Super Swamper Vampire ATV Tires - They are heavier, tougher, have deeper lugs, and better self cleaning ability than the standard Super Swamper ATV tires. That covers the ATV mudding side of things. Unlike more aggressive mud only quad tires, The Vampires are capable of more normal trail riding without beating you and your four wheeler to death. They ride plenty rough but that and the rate of wear are reasonable.